Among the most common conditions experienced by menstruating women is PCOD or polycystic ovarian disorder. Often a chronic condition caused by hormonal disturbances, PCOD can cause severe pain, heavy bleeding, cramping, irregular menstrual cycles, weight gain, excessive hair growth and also in some cases, infertility among a number of other individualised symptoms. While for the most part PCOD is very difficult to cure completely, the condition and associated can be managed with Yoga based interventions to reduce pain and discomfort and improve general quality of life. 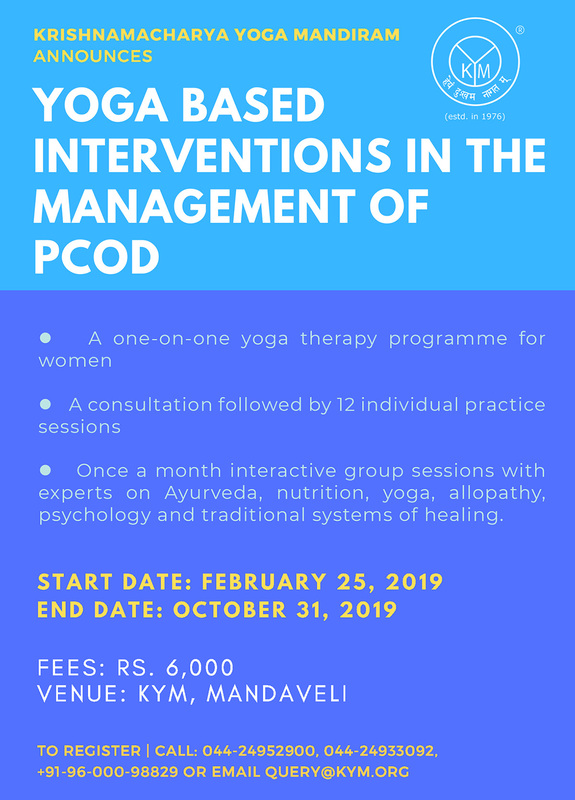 This 8-month programme from KYM aims at offering women a holistic way of understanding and managing PCOD, also offering care seekers a chance to interact with professionals who can offer useful insights with regard to diet, lifestyle, exercise, stress reduction and pain management. After the consultation, the care seeker is required to take one class a week for 4 weeks, followed by one class every 2nd week for the next 8 weeks, and then one class a month for 4 months. In the interim period between each class, a daily personal practice is essential. Practices will be reviewed and adapted/modified based on the individual’s feedback after each class.